Solutions Psychiatric Associates is a group of physicians organized to offer mental health care of the highest possible quality within an outpatient psychiatric office practice. We strive to correctly diagnose our patients and then provide a comprehensive and fully effective treatment plan that is both tailored to their individual needs and also geared toward safe and efficient symptoms relief. Our doctors are board certified and trained at the country's preeminent institutions, are expert in the most up-to-date modes of treatment, including sophisticated psychopharmacology, brain imaging and neuropsychiatric evaluation, believe that patients heal more quickly when diagnosis is made carefully and treatment approach is multimodal. Our clinic provides all modes of psychiatric intervention from the latest and most complex medications to brief supportive or cognitive psychotherapy, parenting help or couples counseling. ​Whether you are clear on what you need or feel completely lost in the maze of options; whether you are considering evaluation for a young child or an aging adult, we at Solutions Psychiatric are confident we can help. We encourage referrals from community professionals, teachers and schools as well as direct contact from potential patients themselves. Please do not hesitate to call or email our office with questions. Our staff is here to help. Non-life threatening urgent issues are handled after hours by by our physicians through email. Click Here for more information. 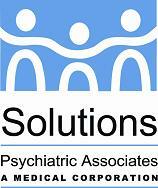 SOLUTIONS PSYCHIATRIC ASSOCIATES DOES NOT PROVIDE EMERGENCY PSYCHIATRIC SERVICES. ALL SUCH ISSUES ARE REFERRED DIRECTLY TO THE NEAREST EMERGENCY ROOM.